The successful Iqra Academy football team. They are Aisha Jaral, Khadij Jaral, Maya Alhamoud, Morna Tourasi, Eimaan Arif, Bayan Alwadi, Amneh Alkahil and Omaya Altaf. A Peterborough-based school have won a national football title for the second year running. The Iqra Academy were crowned Under 14 girls seven-a-side champions at The Association of Muslim Schools (AMS) National Football Tournament held at St Georges Park. They beat Eden School from Coventry 8 - 0 in the final. 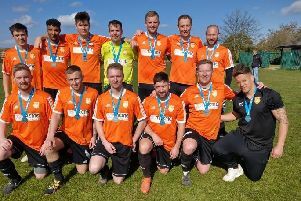 They were also crowned AMS Midlands champions in May. Next week the team travel to the Emirates Stadium to take part in the Arsenal Ladies FC Sister Schools National Festival Tournament, and a week later they travel to Birmingham for the AMS Interfaith Midlands Schools Tournament, where last year, Iqra Academy became the first Muslim Faith School to ever win the annual competition. The school only started playing competitive football last year.